It's called "Dry January." It only got started in recent years and is practiced largely in the United Kingdom. To be more exact, in 2014, the charity, Alcohol Concern registered "Dry January" as a trademark. In 2015, Public Health England partnered with the group for its January campaign. "Dry January" is the custom of urging people to abstain from alcohol use for the first month of the New Year. The primary purpose is to change what has become a dangerous drinking culture. If people see the benefits of reducing their alcohol intake, then they and their friends might choose to do the same. 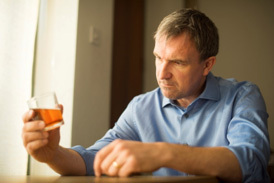 Ian Hamilton, in an article originally published on The Conversation, argues that there has been an increasing trend in overall consumption of alcohol in the UK in the last sixty years. He says that with the increases in consumption has also come a rise in public health issues. Certainly this is not to make the case for bringing back Prohibition, nor does it make the case for the legalization of recreational drug use. It does, however, state succinctly and accurately the inherently problematic nature of alcoholic beverages. With such compelling data cited, certainly there must be wisdom in a campaign that urges people to give up their booze for 31 days. At least, this is what the findings of a study led by Rajiv Jalan at University College London revealed. The study determined that people who successfully abstained from alcohol for the duration of one month experienced significant health benefits. Amazing! In other words, giving up the "giggle water" for just a little while (31 days) is no laughing matter. But what if people just gave it up altogether? There was an interesting article by comedian and writer, Andy Boyle, in the Chicago Tribune recently. Boyle said two years ago he decided to take a breather from drinking. What he learned from his two-year hiatus has now gone viral. Learning you don't have to drink to have fun. You have fewer regrets in life. You sleep and rest better. You experience less sadness in life. So why not give it a try? Why not put down the bottle or that cocktail glass for just 31 days. It doesn't have to be a full month of January for you to take up the challenge. Who knows, you might find you don't need or want it anymore like you did before. You may even decide it's in your best interest to leave the hootch for good. Hamilton, Ian. "Dry January: Is It Worth Giving up Alcohol for a Month?" The Conversation. N.p., 1 Jan. 2016. Web. 08 Jan. 2016.
,  "Excessive Alcohol Use Continues to Be Drain on American Economy." Centers for Disease Control and Prevention. Centers for Disease Control and Prevention, 15 Oct. 2015. Web. 08 Jan. 2016.
,  Ingraham, Christopher. "Americans Are Drinking Themselves to Death at Record Rates." Washington Post. The Washington Post, 22 Dec. 2015. Web. 08 Jan. 2016.
,  Melnick, Meredith. "Those Dry January People May Be Onto Something." The Huffington Post. TheHuffingtonPost.com, 9 Jan. 2015. Web. 08 Jan. 2016. "Academic Research Reveals Dry January Leads to Less Drinking All Year round – Alcohol Concern." Alcohol Concern. N.p., 13 Nov. 14. Web. 08 Jan. 2016.
,  Boyle, Andy. "What I Learned by Not Drinking for 2 Years." Chicagotribune.com. Chicago Tribue, 30 Dec. 2015. Web. 08 Jan. 2016.